When the garbage being produced on a project or at your facility exceeds current capacity, it causes a variety of headaches that can cost you time and money. Whether you're taking on a residential remodeling or construction project or you need a waste handling solution for a business or housing complex, the experts at D.B. Container Service have you covered. We are the one-stop shop for dumpster and container rentals in the Bronx, serving a broad range of homeowners, contractors and commercial industries. Since 2001, we've focused on building long-term relationships with our clients by delivering quality products and services along with customer care dedicated to your 100% satisfaction. When you partner with us for roll off dumpster services, you can rest assured we will treat you with fairness, honesty and integrity. Our experienced team provides all the information you need to make an informed decision about renting the right containers and dumpsters. There are many factors, such as location, available space, materials and capacity requirements, that go into selecting the most useful dumpsters for your project. A residential clean-out job may only require a single 10-yard dumpster, while a significant construction site could call for multiple 30-yard containers. D.B. Container Service's flexible Bronx dumpster rentals provide direct access to reliable roll off dumpster services whenever and wherever it's needed. 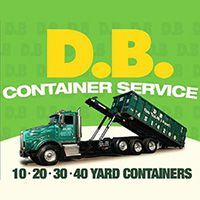 10-yard containers: Spring cleaning, bathroom and closet remodeling jobs, garage cleanouts, and other small projects are more relaxed and organized with a 10-yard dumpster rental. 15-yard containers: Great for garage or add-on construction, kitchen or den remodels, cleaning, landscaping and light interior demolition. 20-yard containers: Use 20-yard containers for everything from replacing roofs and windows to residential construction and deck and siding projects. 30-yard containers: Ideal for more robust jobs such as whole-home renovations, large shed construction, commercial and industrial cleanups and garage demolition projects. If you live in, work at, or own or manage a property in the Bronx, D.B. Container Service is standing by to meet your waste handling requirements. Our roll off dumpster services help home renovation and improvement projects run more smoothly and efficiently. Rather than having to haul dozens of heavy plastic bags and bins, you can simply deposit trash and more cumbersome objects into our on-site containers. You benefit from a cleaner environment, less clutter and less time wasted having to figure out where to dump your waste. We strive to make the process of renting containers from us in the Bronx and throughout the region as fast and straightforward as possible. We offer competitive short- and long-term rates and the most reliable roll off dumpster service in New York City. We are a family-owned company that puts the needs of our customers first. Contact us online or by calling 718-257-2300 to request a one-on-one consultation and a free quote on Bronx container rentals today.